“Machli” what a strange name for a tiger I thought, when our nature guide Satendra Singh spoke about this fascinating tigress in the jeep headed out for zone 5 in Ranthambore National Park. He narrated to us with pride the story of how Machli went missing in the month of January and how she was spotted a few days back in the park again. 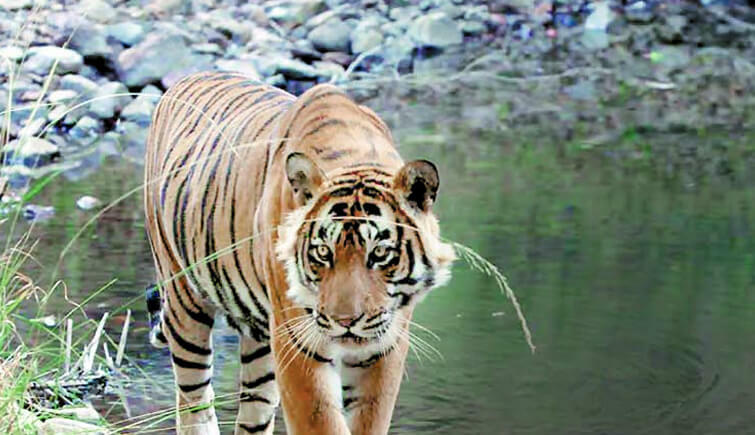 This tigress is reckoned to be the pride of Ranthambore National Park and got her peculiar name because of the fish-shaped mark on the left side of her face. Singh told us that last Machli was spotted in this zone and gave us hope that we might spot her here again. My best friend Shefali and I overjoyed with the hope Singh incited in us and looked intently out of the jeep like any first-timer in any national park would… After all Ranthambore was a much anticipated and one of the well-planned trips Shefali and I had decided to take up together. Research and Advance Bookings Always Pay Well..
Google you are just great! I exclaimed after researching on Ranthambore National Park and fixing all the bookings of train tickets, hotels and safaris. The sprawling 392 square km of sheer adventure was calling us!! 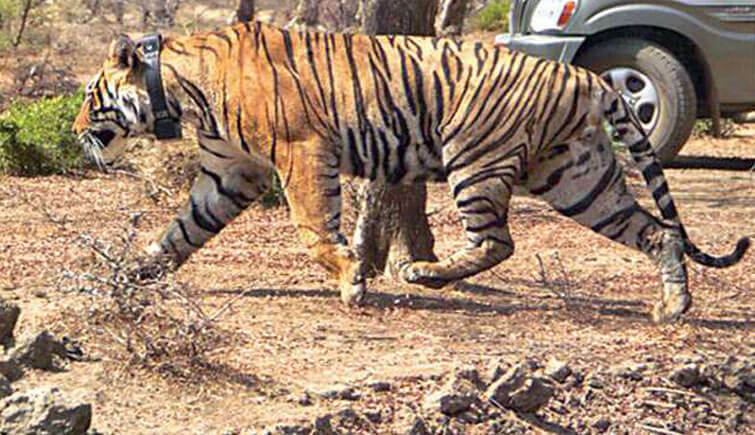 Ranthambore National Park is situated in Rajasthan and at a distance of approximately 14 kms from Sawai Madhopur. This national park is the reigning refuge for Tigers, thus your odds for seeing a tiger are better here than anywhere else in India. 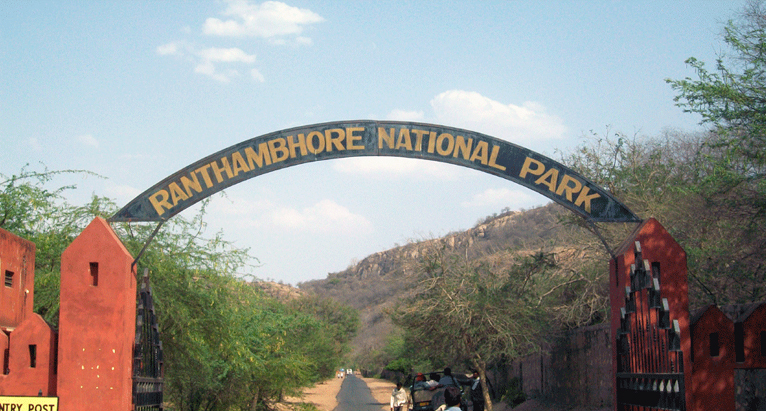 Besides, tigers, the 10th century fort inside the park are a prime attraction of Ranthambore National Park. Mostly jagged terrain of the national park is also the home to animals like Leopards, Striped Hyenas, Sambar deer, Chital, Nilgai, Macaques, Jackals, Jungle cats, Caracals, Small Indian Mongoose, Indian False Vampires, Sloth bears, Black bucks, Indian Foxes, Rufoustailed Hare, Indian Wild Boar, Chinkara, Common Palm Civets or Toddy cat, Coomon Yellow Bats, Five-striped Palm Squirrels, Desert Cats, Indian Flying Foxes, Indian Gerbilles, Indian Mole Rats, Indian Porcupines, Long-eared Hedgehogs, Ratels, Small Indian Civets and Common mongoose… BOY! I was Superr Excited! Undulating terrain, shallow soil mark the sub-tropical dry climate of this national park. A wide variety of flora can be seen in different zones. The presence of wetlands and grasslands make Ranthambore a thriving shelter for many wild animals, reptiles and species of birds. Each zone has something special to it, Zones 1-5 are situated in the core area, while 5-10 are in the surrounding buffer zone. 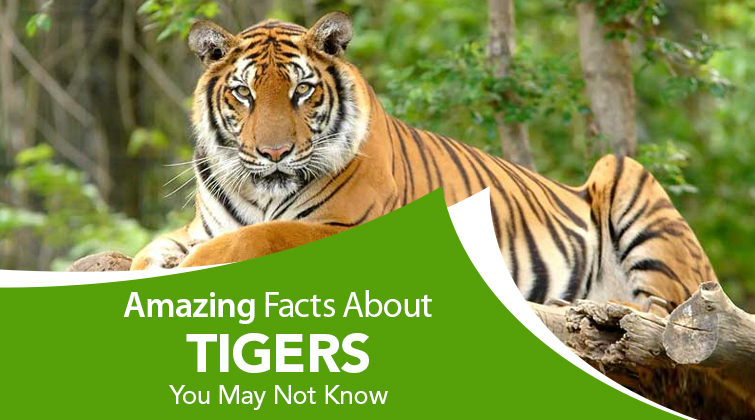 Tiger sightings have fewer chances in the buffer zones, although you can spot a lot of wild animals like chital, spotted deer, Indian flying foxes and wild boars in the buffer areas. The forest comprises largely of banyan trees, dhok, pipal trees and babul trees. We boarded Golden Temple Mail (departure New Delhi at 0800 hours and arrival at 1300 hours), so that we can take a day off and visit locales of Sawai Madhopur. Shefali sure wanted to buy one of those ‘Khas’ perfumes and other items made of the same. I, on the other side wanted to rest my back on a comfy mattress before we set out for an exciting trip to Ranthambore National Park next day. After a comfortable night at a hotel in Sawai Madhopur, we left for Ranthambore around 8 a.m. We reached the park the park by 8.45 a.m and after all the formalities checked into our cozy, well-appointed resort’s room. There plenty of hotels and resorts around the park, one has the choice of staying in a resort or in a resort’s tent, there are also option for wilderness retreat and farmstay. Budget should not bother you much as most of the resorts are priced moderately. Safari Basics.. Know Your Ride Well! So, here we were, right in the heart of Ranthambore! We lingered in the room and waited for the jungle safari, which was scheduled at 2 p.m. There are two options for jungle safari in Ranthambore; one is jeep safari and the other is canter safari. Timings for safaris in Ranthambore are 7.00 a.m to 10.00 a.m and 2.30 p.m to 5:30 p.m. between November and January. For summers (April to June) the timings are 6.00 a.m to 9:30 a.m. and 3.00 p.m to 6.30 p.m. During October the timings are 7.00 a.m to 10.00 a.m and 2.30 a.m to 6.00 p.m. And for February and March timings are 6.30 a.m to 10.00 a.m and 2.30 p.m to 6.00 p.m.
A well-planned trip always is ideal! Since we had ample of time before the canter safari that we were scheduled for, Shefali and I decided to venture out and explore the surroundings of the resort, we met a large group of students, who had come all the way from Ranchi, Jharkhand. A jolly bunch it was! Reminded me of my college days… After a chat with them, we realized they were going to accompany us on the canter safari this afternoon… IT SHOULD BE SOME GOOD FUN, I thought. We also noticed a long queue on the safari booking counter, which is located near Taj Sawai Madhopur Lodge hotel, patting each other on the back for deciding to book safari in advance, we moved further to explore the region. Back at the given time for the safari, Shefali and I met the college group near the canter. Everyone was excited! 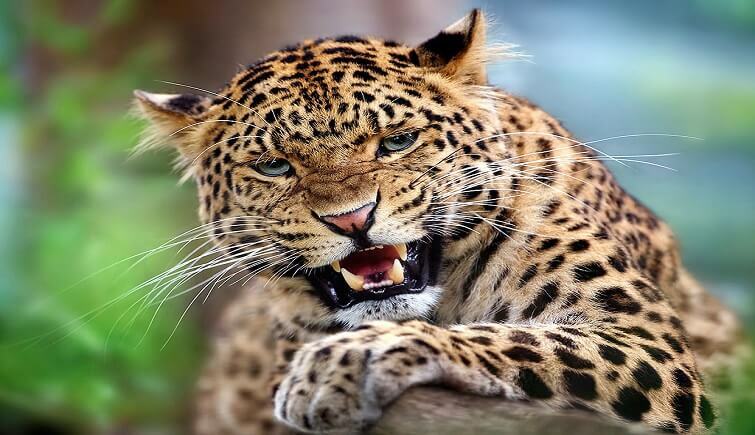 Abhi, the funniest guy in the group of the students was imitating how each one in the group will react after seeing the tiger. It was a good start, and each us knew it is going to get better! We were scheduled for Zone 1 today; the entry point was Singh Dwar, which had a HUGE banyan tree at the entrance. Reckoned to be the second-largest and one of the oldest trees in India, it made up for some decent clicks. We were introduced to our nature guide Satendra Singh, who I named as Honey Singh because of his light brown colour of his eyes, hair and mustache that was prominent enough to mark his exceptional appearance. Zone 1 seemed to start impressing us and I felt so small with every kilometer inside this vast zone. 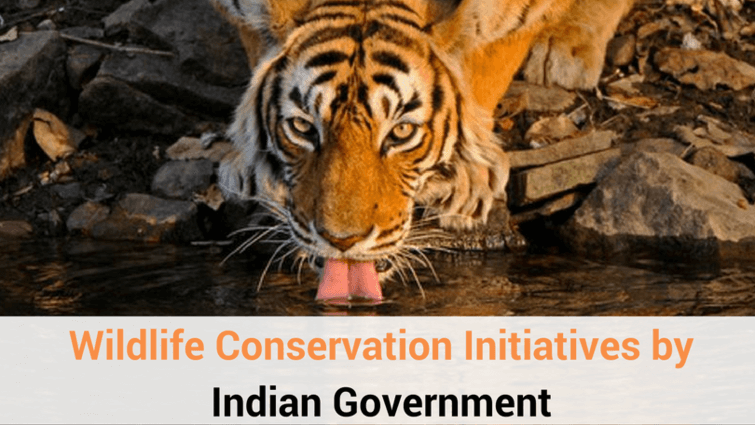 Dhoop Chowk, Kala Peela Pani, Tuti Ka Naal, Sultanpur Chowki, Khabli and Khariya are some places where the odds of spotting of tigers are better. Satendra AKA Honey Singh informed us that T-72 (Sultan), T-39 (Noor) and T-24 (Ustad) are the few tigers that have been spotted in this region. We only had two more days in the park, so we decided on covering Zone 2, 3, 5 and 6 in this expedition and leave the other zones for another trip next year, as we knew in our hearts we are coming back to this place!! The main points of Zone 2 are Bada Gate,Jogi Mahal, Jhalra, Phuta Kot,Nal, Phuta Bandha, Gaandra Deh, Ghati(Kamaldhar), Amrahi, Parniya, Guda Chowki, Telan Pacheri, Pandu Deh, Lahpur Tiraha, and Rishi Ka Deh. T-19 (Krishna), T-20 (Jhumru), T-22 (Gayatri), T-24 (Ustad), T-39 (Noon) and T-72 (Sultan) are the tigers that can be spotted here. The next safari was at 2.00 pm for Zone 7. The important points of Zone 7 are Rajbagh Naka, Chidikho, Kushalipura and Jamoda. T-8 (Ladli) with one cub and T-34 (Kumbha) was spotted here recently although we weren’t lucky enough to spot a tiger here as well. On day 3, Shefali insisted on taking up a jeep safari. So, we requested Honey Singh to arrange for the same and accompany us on the last day of the expedition. He agreed and we set out early at 6.30 a.m for Zone 5. “Machli was last seen in this zone” Honey Singh told us happily. He said, we might get lucky today and carried on with his description of Zone 5 of Ranthambore National Park. 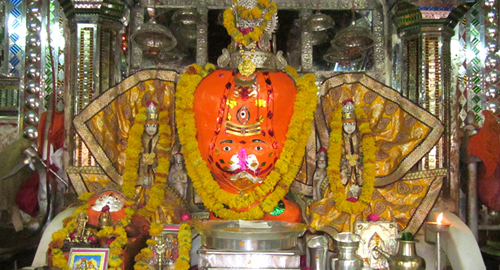 The prominent places in this zone are Takiya Kui, Bakola, Singh Dwar, Jokha, Kachida,Tamba Khan, Dhakda, Bagdah Tiraha, Pili Ghati, Anatpura and Gular Kui. Tigers named T-6 (Romeo), T-3 (Bhadur), two cubs of T-17 (Sunehari) and T-25 (Bhola/Dollar Male) reported to have been spotted here. We spotted Sambar deer, Chital, Nilgai, Macaques, Jackals, Jungle cats, Caracals, Small Indian Mongoose and many other animals but No Tiger! I was a bit disappointed. Nonetheless the jeep safari to Zone 5 was splendid! We headed back to resort tired but happy. The next safari was scheduled at 2.00 p.m for Zone 3. While still in the room, Shefali and I sorted out the plan of where we want to go after Ranthambore. There are lots of places near Ranthambore National Park for excursion like Bakula, Raj Bagh Ruins, Surwal, Ganesh Temple, Rameshwaram Ghat, Jogi Mahal, Chouth Mata Temple, and Sawai ManSingh Sanctuary. Out of which, Rameshwaram Ghat, Raj Bagh Ruins and the forts of Khandar were our picks. After having delicious meal at the resort, we were finally ready to take up Zone 3. Honey Singh was standing near the jeep, talking to other tourists who were going to accompany us on the final zone of this trip. 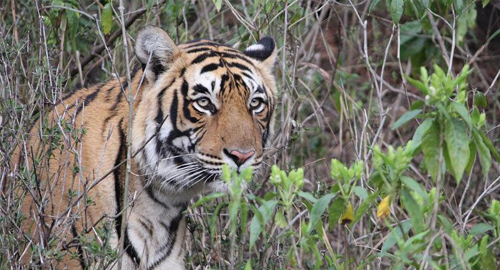 We started sharp at 2.00 p.m, hoping and praying that we get one glimpse of a tiger, so that we can go back home and tell this story hundreds of times to family and friends. 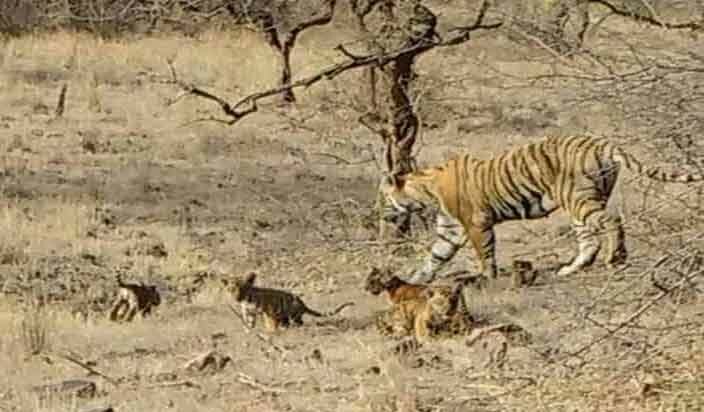 Doodh Baawri, Rajbagh Lake, Tapman Nalah, High Point, Padam Talab, Mandook and Karonj Ka Nalah are the important points of Zone 3 and according to our nature guide Honey Singh, T-19 (Krishna) along with her three cubs and T-28 (Star Male) were spotted here recently. Not ashamed to call myself a first-timer, I was looking out in the vast land only to catch one glance of a tiger. It happened then…. Honey Singh with a prominent gesture pointed towards my left “Here! Tiger!” we immediately turned towards where his finger was pointing at… In a distance of half a kilometer, I could see something like a yellow colour lump hiding away in the grassland, my excitement had made my eyes watery, on the other side, Shefali, who was far more active than me quickly clicked pictures of the tiger. I stood up to get a better site of the tiger and what looked like a lump to me before, now had taken a prominent shape of a Bright Big Cat that evidently noticed our presence from the grassy land and finally decided to head out somewhere else. GOOSEBUMPS!!! It was T-65 (Suraj) according to Honey Singh, and indeed he made our trip a BRIGHT success!